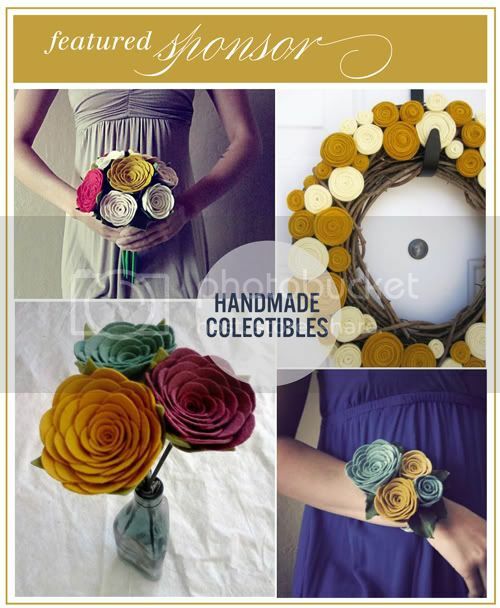 Today's featured sponsor is Handmade Colectibles. Nicole offers simply beautiful flower creations made from felt! I actually got 2 wreaths for my wedding, they were just lovely. I'd just want one big bunch of mustard flowers, you know I'm a sucker for mustard ;) Check out Handmade Colectibles on Facebook and follow Nicole's blog! Thanks for supporting our sponsors! I'm loving the felt flower bouquets. These items + this post are so beautiful! Caught me off guard in my RSS feed reader and I had to do a double take. Hi there! I just discovered your lovely blog. I'm just new into blogging this year & have just finished off my own blog on fashion, food, travel & interior design. Aren't her flowers just perfect -PERFECT! Love it!